The Fire and Water Podcast Network Presents… WHO’S WHO: UPDATE ’88 PODCAST, volume 3! The third episode of our WHO’S WHO UPDATE ’88 podcast is now available — the show that dares to tackle one of DC Comics’ greatest publications! Each episode Rob and I cover a single issue of the legendary 1980s series, Who’s Who: The Definitive Directory of the DC Universe. 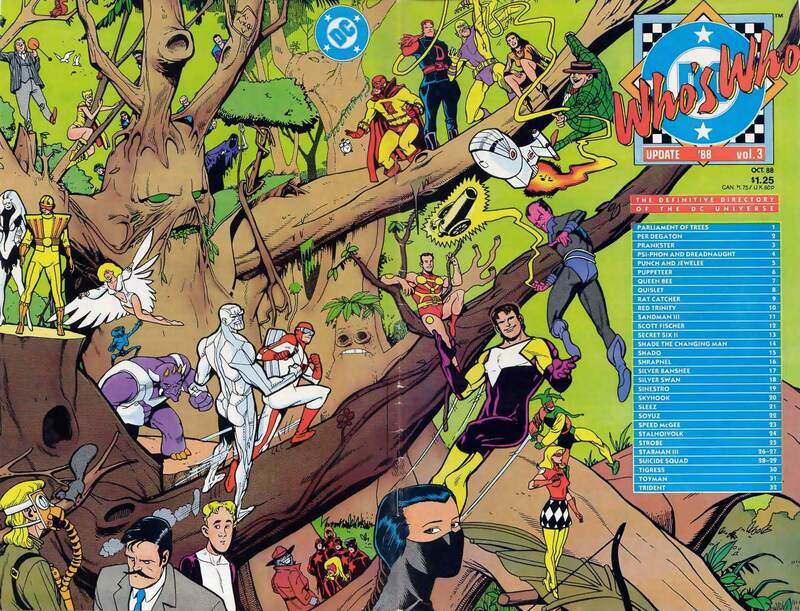 This time around we chat about WHO’S WHO: UPDATE ’88, volume 3, discussing characters such as Per Degaton, Rat Catcher, Shade The Changing Man, Sinestro, Starman, Suicide Squad, and more! We wrap up with your Listener Feedback! This episode sponsored in part by InStockTrades.com! One of the coolest aspects of each Who’s Who issue was the amazing wrap-around cover! Check out this exceptional cover by Ty Temploton! Click the image to enlarge. First up is the teenage Soviet super-team, Soyuz by Joe Brozowki and Sam De La Rosa. 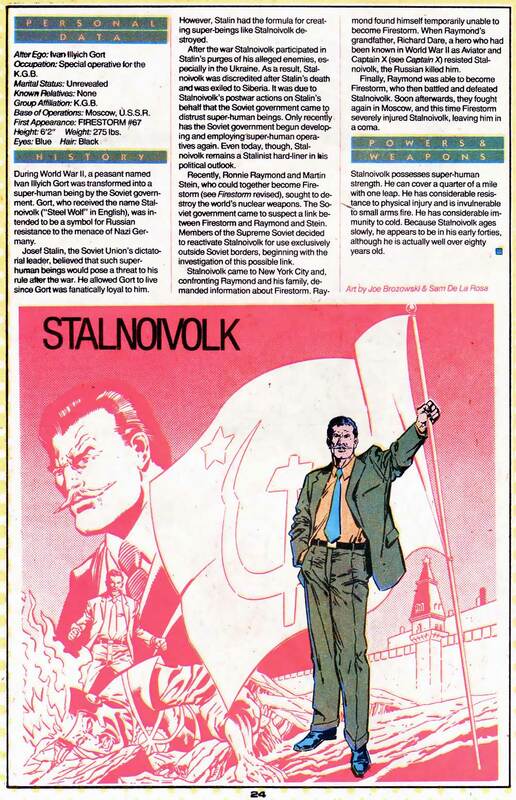 Soyuz lived in the Soviet Union and were supporting characters during the “Blank Slate” period of Firestorm. 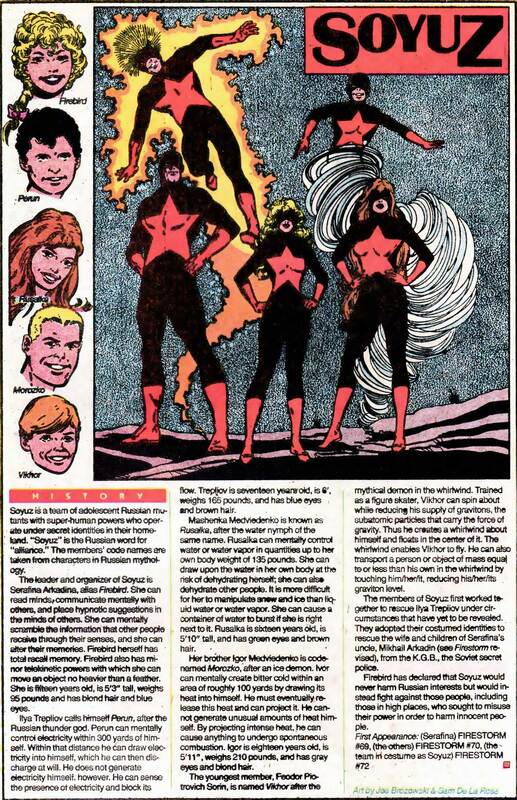 Firebird was the niece of Mikhail Arkadin (one part of Firestorm). Click to enlarge. Next up is the Firestorm foe, Stalnoivolk (Steel Wolf) by Joe Brozowki and Sam De La Rosa. Steel Wolf was essentially a Soviet Super Soldier. Similar to Captain America in his physical abilities and his patriotism for his country. He first appeared in Fury of Firestorm #67 and eventually went on to work with the Suicide Squad. Click to enlarge. Remember, please leave your comments over on the FIRE AND WATER PODCAST website by clicking here! Posted in: Firestorm #02: Blank Slate (Ron/Mikhail/Stein), Firestorm comic vol. II, Joe Brozowski, Mikhail Arkadin/Pozhar, Podcast, Who's Who.